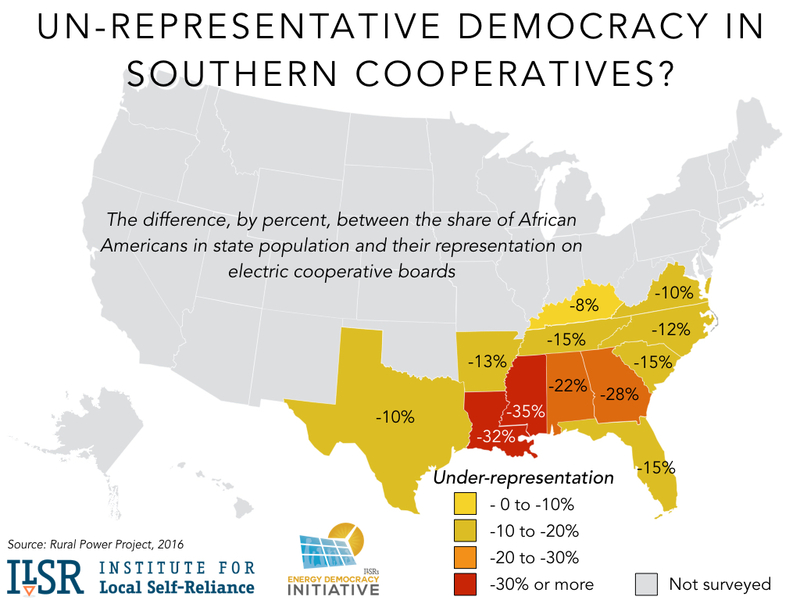 Exempt from state regulation in 33 states because they purportedly offer democratic and local control, new data on the nation’s rural electric cooperatives suggests that skin color is still a major barrier to their democratic representation. In 32 years, little has changed for electric cooperatives in the South. A recent study published by The Rural Power Project shared results of a similar survey (of 313 cooperative boards) and found just 90 blacks among the 3,000 board members. This 4% proportion of African American board leadership is in states where the black population represents more than 22% of the total. The disparity is even higher between men and women, with men representing 90% of board members but only half the population. 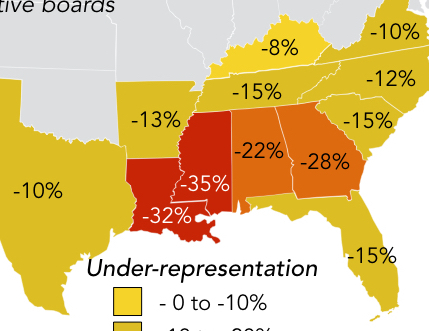 The following map (created by ILSR, based on the report data) illustrates the disparity between the racial composition of electric cooperative boards and their respective state populations, ranging from 8% in Kentucky, to over 30% in Mississippi and Louisiana. Representation by people identifying as Hispanic was similarly low relative to population: just 0.3% of board positions were filled by a person identifying as Hispanic, in states with an average population share of 10% Hispanic. 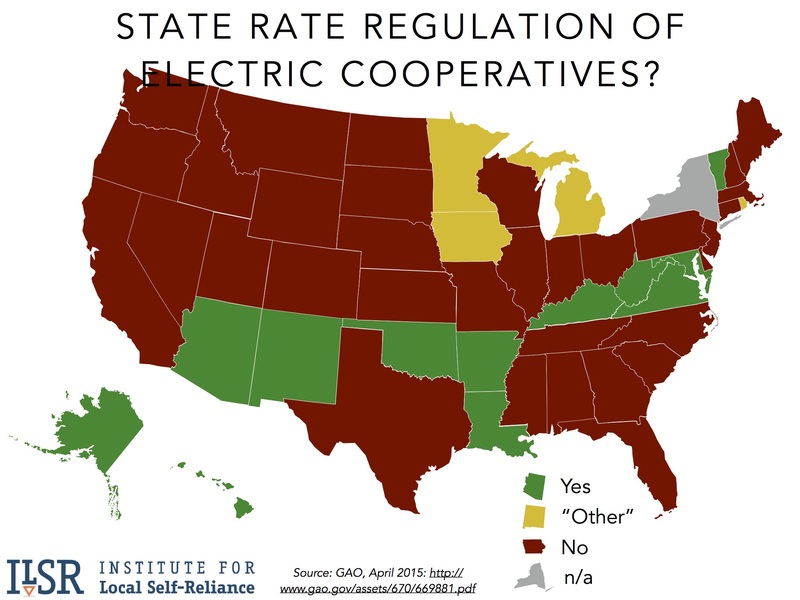 The above map is somewhat deceptive, because rural electric cooperatives were for many years subject to (minimal) oversight by the Rural Utility Service of the U.S. Department of Agriculture, due to their reliance on federal financing. 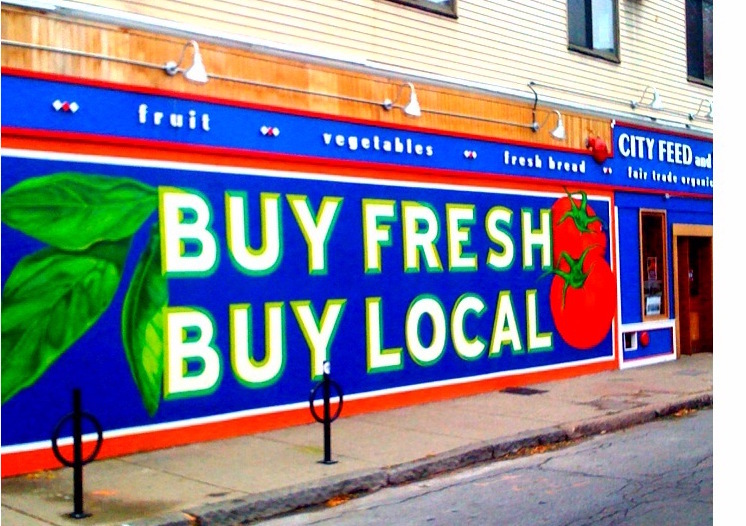 n recent years, however, cooperatives have increasingly used their own financing, reducing even that small level of scrutiny. The parallels across time are striking. The 1984 New York Times story includes a tale of a rigged election (where the board rescheduled the annual meeting to another time, and proxy votes were used to re-elect the entire all-white board), eerily similar to one shared in ILSR’s recently published report on Re-Member-ing Rural Electric Cooperatives, where Randy Wilson of Jackson Energy Cooperative found his campaign drowned by proxy votes. Low member engagement reinforces an ailing system of local democracy, with three-quarters of rural electric cooperatives having less than 10% turnout for their board elections. The issue of democracy at a utility company would normally be an internal matter, but rural electric cooperatives are notable for their particularly deep reliance on coal-fired electricity and on very long term contracts tying them to this resource. 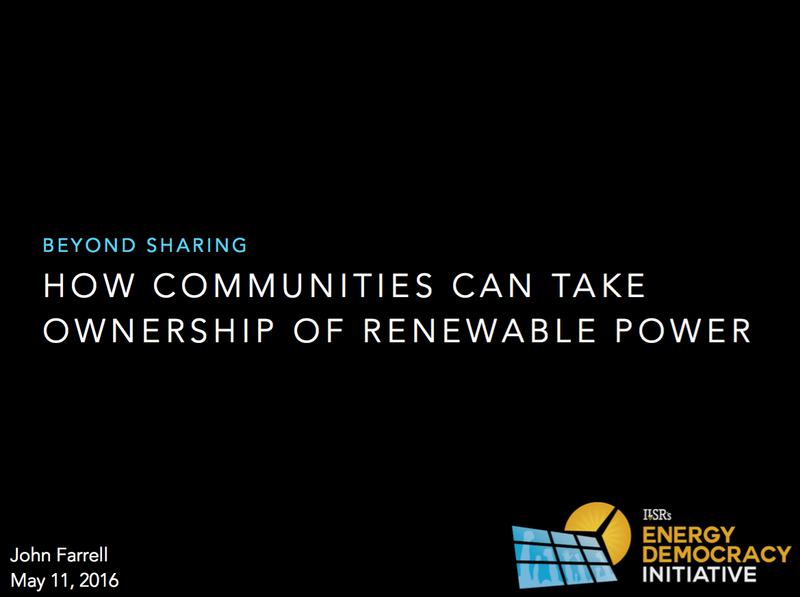 Through these contracts, the smaller, local cooperatives have often ceded nearly all their power to generation and transmission cooperatives, giving them little leverage to embrace the changes wrought by inexpensive renewable energy or smart, two-way technologies. As the country begins to account for the enormous health and environmental costs of coal in its electricity prices, many rural residents may be left holding the bag of the utilities that have been exempted from typical regulator oversight.